8818 |أ‎| 11 Normal series since 2000. 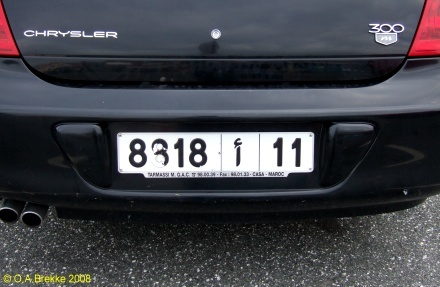 11 = Casablanca - Al Fida Mers-Sultan. The Arabic letter in the middle is 'A'. أ‎ | 33/1148 Normal series since 2000. 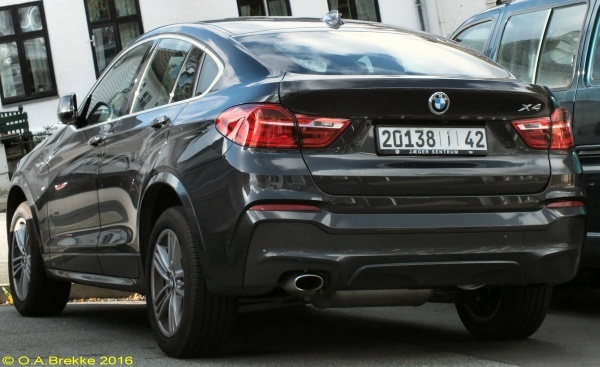 33 = Agadir-Ida Ou Tanane. The Arabic letter at upper left is 'A'. 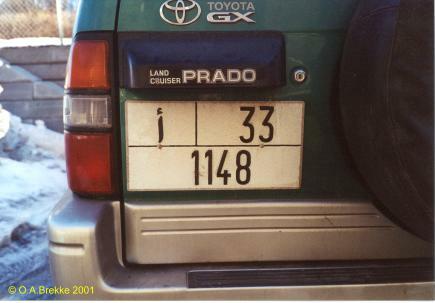 20138 |أ‎| 42 Normal series since 2000. 42 = Larache. The Arabic letter in the middle is 'A'. 20138 |أ‎| 42 Close-up of the above. 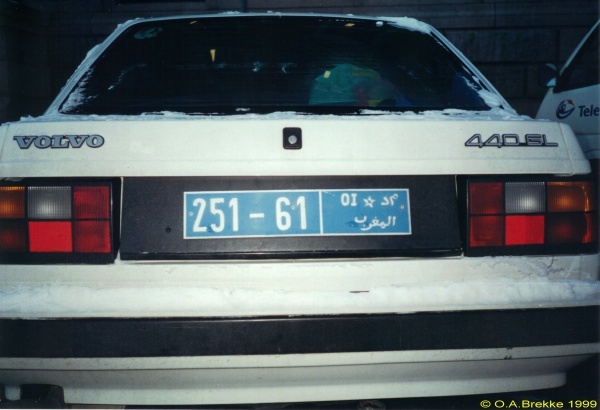 40829 |أ‎| 40 Normal series since 2000. 40 (at the end) = Tanger Asilah. 40829 |أ‎| 40 Close-up of the above. 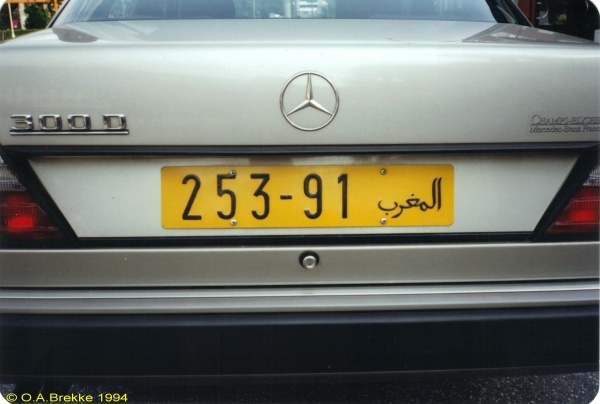 32190 |أ‎| 72 Normal series since 2000. 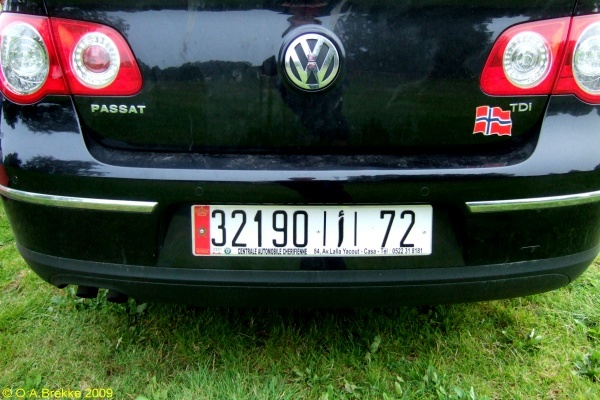 72 = Casablanca Californie (since 2006). The Arabic letter in the middle is 'A'. Red band with the Moroccan flag to the left. 32190 |أ‎| 72 Close-up of the above. 4889-45|2 Normal series 1983-2000. 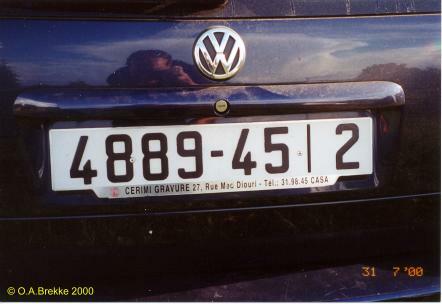 45|2 = Casablanca. 253-91 Foreign residents series 1967(?)-2000. 91 = Issued in 1991. 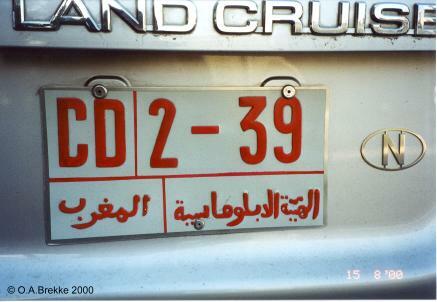 The Arabic text translates as El Maghreb = Morocco. CD 2-39 Diplomatic series 1975(?)-2000. 1978(? )-2000 plate style. CD = Corps Diplomatique. 39 = Norway. The Arabic text in the left box translates as El Maghreb = Morocco. The text to the right apparently means "The Diplomatic Corps". 251-61 OI Diplomatic series 1975(?)-2000. 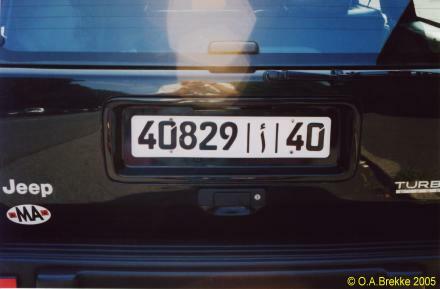 1991-2000 plate style. 61 = United Nations (first seen in 1991). OI (also in Arabic) = International Organizations.